I have some diy projects coming up for you. Today, I am sharing sprucing up the home office on a small budget. Some of you may know if you follow me on facebook for the past 6 months or so, I have complained or talked about a frozen shoulder issue I have been having, a time or two, or three. One of the main culprits of this frozen shoulder issue was my home office set up. Basically, I have been working out of an armoire desk for four years. NOT a good set up and believe me, it takes a toll on your neck and shoulder after while. 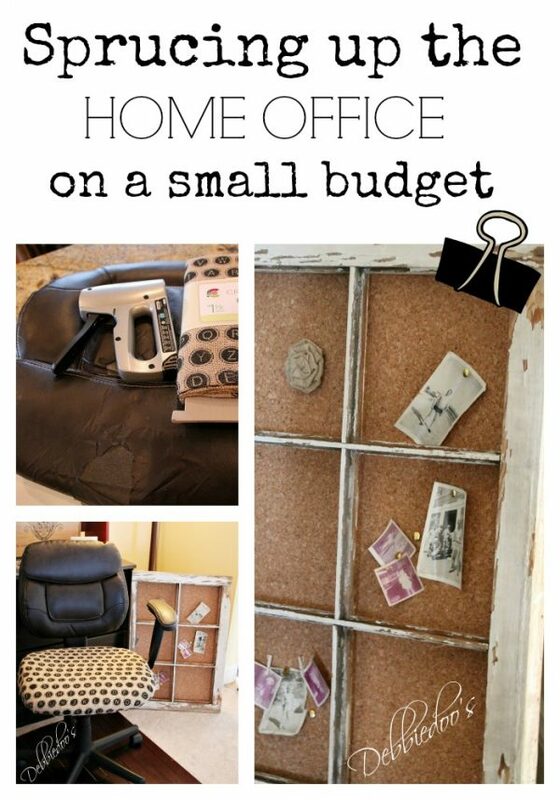 Enough ramblings, let me show you some budget friendly ideas for you to spruce up your home office. We did invest in a new desk and I will be sharing that with you at a later time, once I get organized and cleaned up around here. Because of that investment, I have to cut corners in other areas to save. In other words I will not be going to buy all new stuff in here. This is what happens to a faux leather chair when you are on it too many hours in day. Embarrassing..but it is what it is! First thing my husband said is WOW you need a new chair. I said I LOVE my chair, it is comfy, I can fix this. I am no stranger to reupholstering chairs. It is so easy budget friendly. I found the burlap at Walmart. Loved the print and thought it is perfect for an office setting. Cut to size and give yourself around 3 inches or more of extra fabric on each side. You can see a complete step by step on how I reupholstered our kitchen chairs last summer. It’s like wrapping a gift in a sense. You start on one side folding over, staple, pull and work around to the other side. If you have too much fabric just trim it up when done. Better to have too much than too little. You can’t fix that and would have to cut to size all over again wasting fabric. You may have just spied the old chippy window. I scored that at our local antique store for $10.00. I found one last year and refinished that one into an old chippy chalkboard for the kitchen. I took a piece of cork and nailed it to the back. You can find cork at your local hobby shop, or even Walmart sells it. Now I have a memo board near my desk to tack notes, photos or whatever else need be. 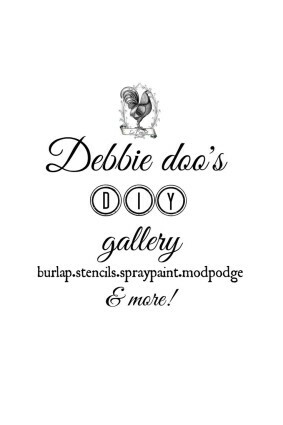 You can check out my DIY gallery of ideas while you are here. And if you like old windows, check out this gallery down below! Lots of neat ideas. 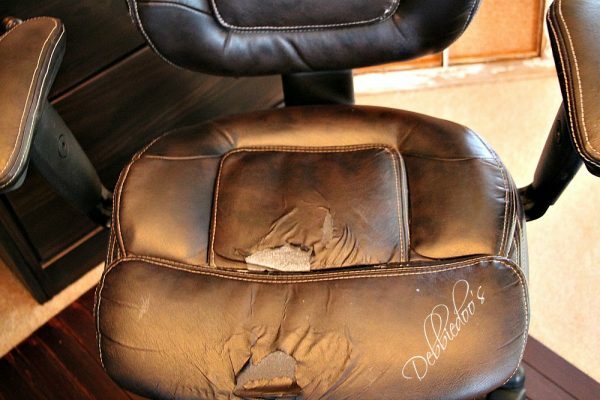 Perfect Debbie, you gave the chair new life without spending a bundle. That’s my kind of redecorating. Cute fabric and perfect for an office chair. Love the old chippy window idea, too. No desk for me. Just my lap. Not good Kim! Not good lol. Wonderful redo. I love my office chair too, and it was a curbside freebie!! I have a chair that is worn also. I put tape on the arms and it is peeling up and my husband keeps telling me I need a new chair. I am going to Walmart’s this afternoon and get some fabric. I also have a window – four empty frames in a row and you have inspired me to do something with that too. Thanks. 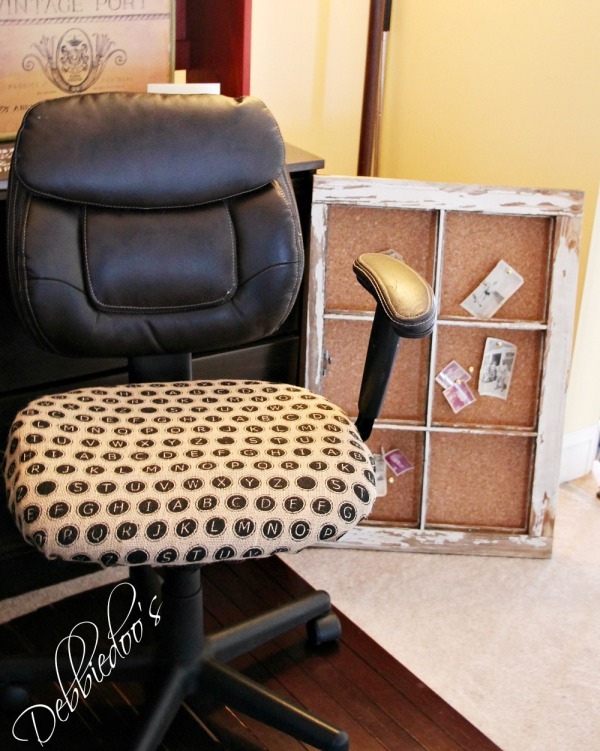 I love the fabric….how perfect for a home office! Way to rock out a NEW looking chair. That is super cute Debbie. That fabric is perfect. And I love the window. Wow, it is really coming together!! So happy for you. Debbie I am loving these changes and that fabric on the chair is so very cool. The bulletin board is really pretty too! You always nail your projects!! Great job! I love the fabric…and yes, perfect for an office. I’ve seen that burlap at Walmart and thought it was cute, your chair looks great! Love the redo. The chair is fabulous. I love that print on the fabric. 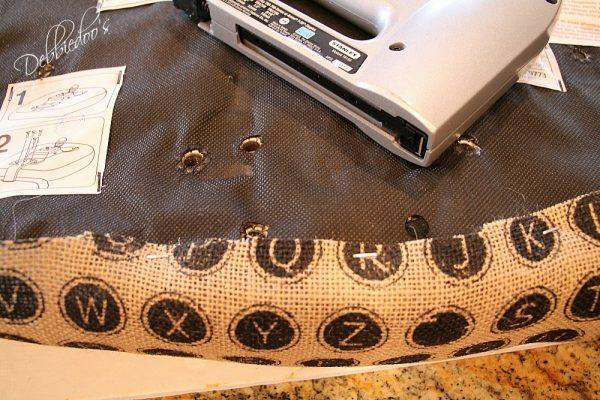 It is great that you can keep that old comfy chair and make it look new with a little fabric and staple gun. Wooooo Hoooooo it looks great. 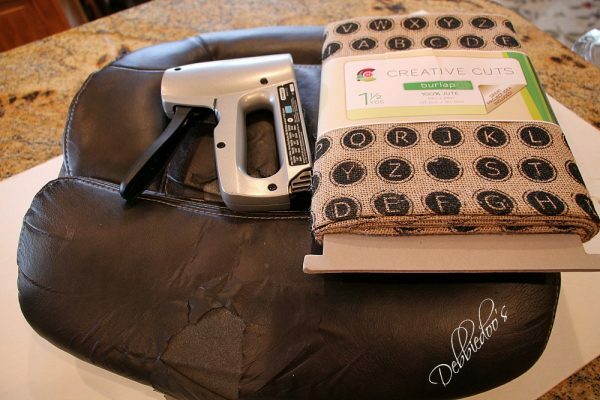 What a great fix for the well-worn & comfy chair! Super-cute print on that burlap. Well, there is going to be no holding you back now! Glad your shoulder is feeling better! Love that fabric – I spotted it at Michael’s the other day! And who could go wrong with an old window? I’m creating my office too – slowing but surely! Debbie, What a very cute chair transformation! I love that fabric… and have it! I got it from Walmart too. YOur window is a great creative idea! I like you style! 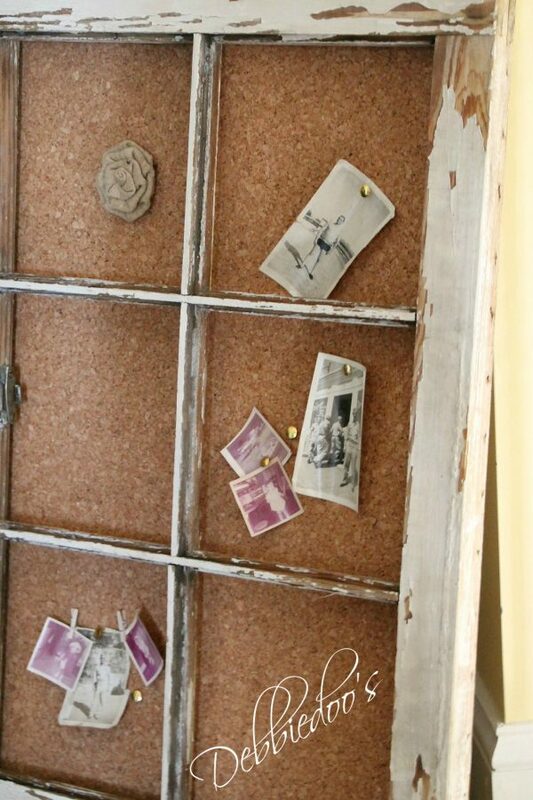 The fabric on the chair is fabulous, and I really LOVE the cork board window.. A great look! I love the cork board so much. I wouldn’t have thought to cover the chair. It looks cool like that. 🙂 Happy snow days…ugh! I love both the chippy mirror and the chair makeover. So, I guess it really is/was a genuine BLOGGING injury with the shoulder, wasn’t it? I’m pretty positive that it is the desk/chair set up here that causes problems for me. I’m planning to address that sooner rather than later. Yes indeed it is due from my set up and way too many hours spent in a bad position. I have an office chair in need of something like that. Unfortunately it is not as comfortable anymore. Could I add some kind of cushioning? Yes, Heidi, they sell cushion as well like at Hobby lobby and Michael’s. Easy fix, you can do it! Love the chair redo and that fabric is adorable. Great job, Debbie. I love that fabric, it IS perfect for an office! 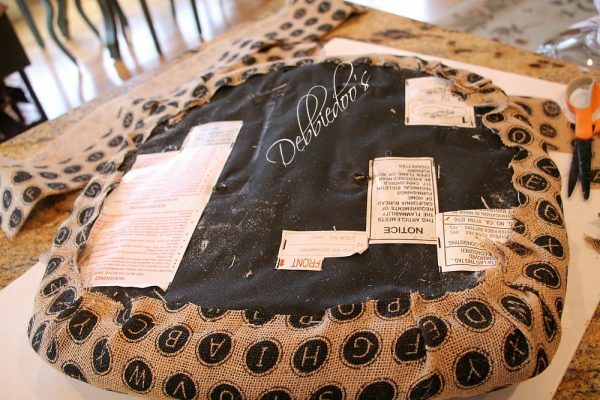 Love the new chair cover Debbie…! I love the new material on your chair! 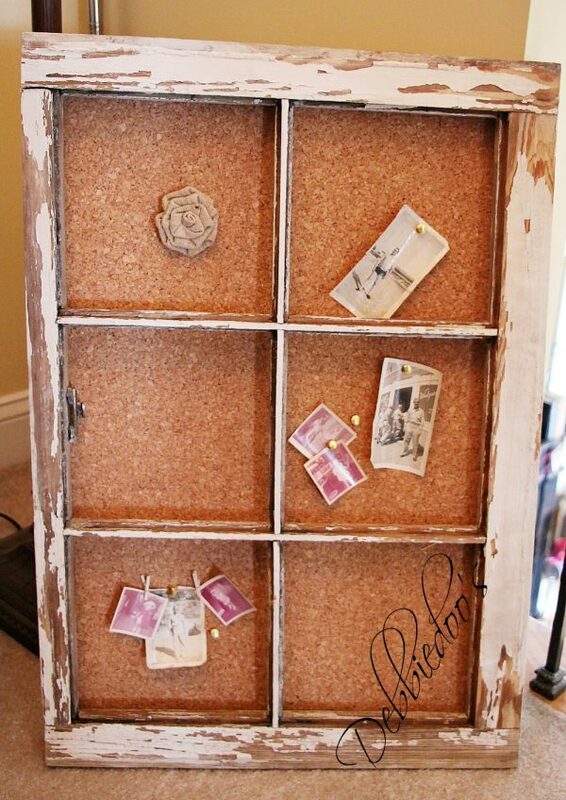 It does look perfect for the office area, and that old window is just what you need for a corkboard. Looking forward to the rest of the makeover. Cute! The chair looks wonderful. I hate to say it, but my similar chair just went to the dump. So sorry I didn’t see this post earlier! I’m a writer and have suffered my share of neck, shoulder, and lower back pain. Recently, I purchased a lap tap. Now I write from various locations. It’s rare that I actually use my desk. This has definitely helped all my aches and pains. Hope you feel better soon!